Envision students sitting at the feet of their masters. Great artwork has portrayed the likenesses of Plato, Socrates and Jesus teaching. Okay – not exactly like that – but the Artaria String Quartet residency program is pouring love and appreciation of great composers into hungry minds and souls of orchestra students in Grand Rapids. The Artaria residency is part of a grant from the MN Arts Board. The group has been working with local orchestra students for the past year. Meeting them at the schools to do one on one and group training. Training sessions are encouraging and illuminating. From students learning how to communicate nonverbally with their peers during a performance to timing, posture and sound details. Part of the goal is to prepare them for a public performance with Artaria on March 26 at The Reif. 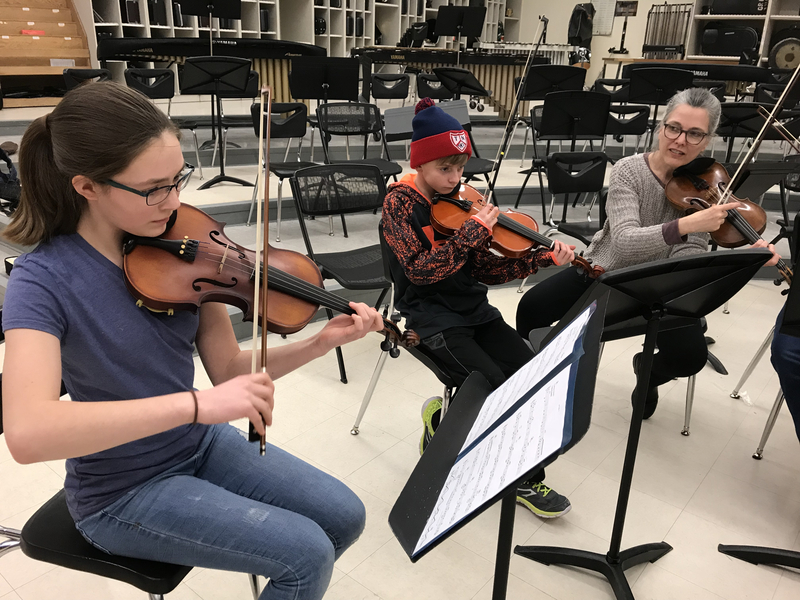 Artaria members are quick to give credit to the day-to-day influence and training of local teachers like Sarah Kowitz, Itasca Orchestra instructor. During the Artaria show, five student groups will be playing with the quartet. “They are playing as part of an ensemble, and are part of something bigger. It is not so intimidating as playing alone can be for a younger student,” Kowitz explained. The 7:30 p.m. performance will focus on the music and talents of the renowned Artaria String Quartet including what Shows promises to be elegant, familiar and some fun and surprising pieces. Part of the evening will include student work, some side-by-side with Artaria.